Tone up your lower abs and lower stomach with stability ball leg raises. The stability ball is a great tool for ab exercises, but in order to tone your stomach you also need to focus on toning exercises for your entire body, cardio to burn calories, and a fat burning nutrition plan. Stability leg raises work the entire abdominal region, but place slightly increased emphasis on the lower portion of the stomach. Below are the pictures of this exercise. 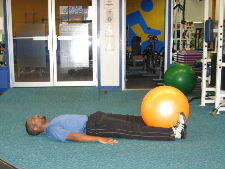 Starting Position: Lie on your back and place a stability ball between your feet. Place your hands at your sides for support or place your hands just under your hips for support. Form: While keeping your lower back stable, lift your legs until your hips are at about 90 degrees. Hold for a brief moment at the top and then slowly lower to the starting position. You can take pressure off your lower back by limiting the range of motion. Instead of lowering all the way down to the floor, lower only as far as you can control. You may only lower to about 45 degrees. When you are lowering your legs, reverse directions if you feel your pelvis tipping or your lower back arching excessively. 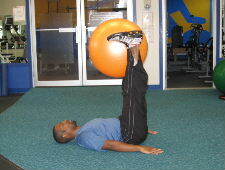 The stability ball adds a little weight and coordination to traditional leg raises. You can build up your strength with regular leg raises first before trying leg raises with a stability ball. Lower abs exercises do help to tone the lower part of your stomach. When you exercise your stomach muscles, you can firm them up. But if you have large amounts of fat covering up your stomach muscles, you won't likely see a big difference in how your stomach looks if you only focus on exercises for the stomach. If you want to tone up your tummy and stomach, you need to take a comprehensive approach to losing weight and decreasing body fat. Weight training for your entire body is important for supporting a healthy metabolism, and aerobic exercise is important for burning tons of calories. Total body fitness is one key to toning your stomach, but the most important thing to do is eat a healthy fat burning diet. Without a good diet it will be difficult to tone your lower abs and lower tummy. So focus on weight training, cardio, and nutrition to tone up your stomach fast. Read the page on lower abdominal exercise physiology to learn more lower abs workout tips.